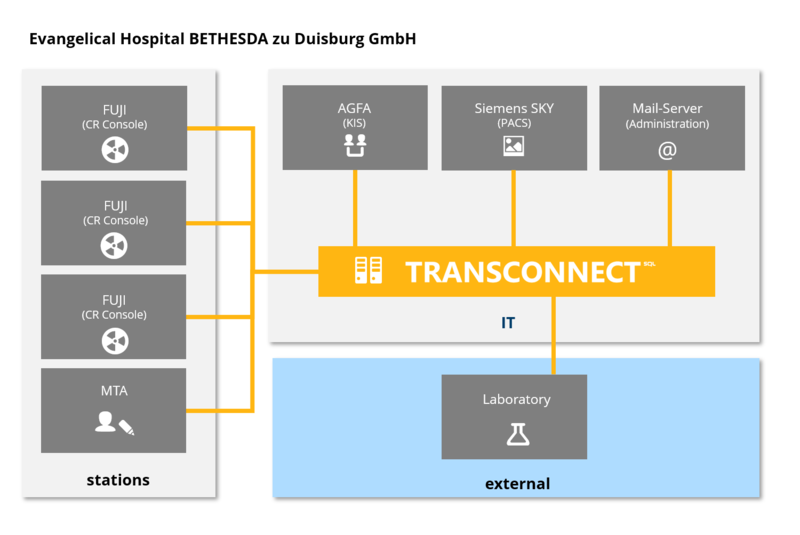 In any hospital, each department is a world on its own, with applications that are tailored to its specific tasks, such as laboratory systems or X-ray systems. The sum of these applications and the central Hospital Information System (HIS) for centralized management all patient data form the IT infrastructure. The challenge for the IT department is enabling a smooth flow of information between systems that work with different data formats and standards. 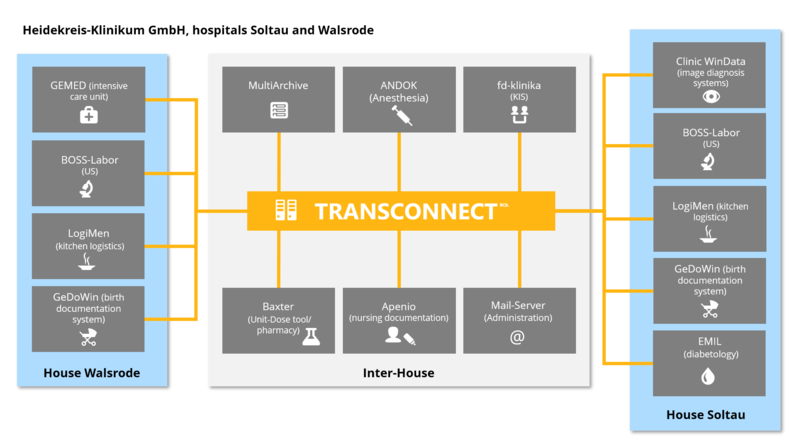 TRANSCONNECT® provides valuable services in many hospitals. It supports key standards such as HL7 and DICOM which have become established in the healthcare sector. The HL7 format is used mainly for exchanging patient data. It specifies and displays events such as admission, transfer or discharge of a patient. Patient data, which has been captured in HL7 format, can thus be transferred to the laboratory system. Medical results from the laboratory system can then also be made available to the department in HL7 format. DICOM facilitates more effective work on X-ray machines. X-ray jobs are collected from the various departments, and can be provided on the X-ray machine in the form of a so-called job list. It is no longer necessary to perform complex acquisition of the required patient data. 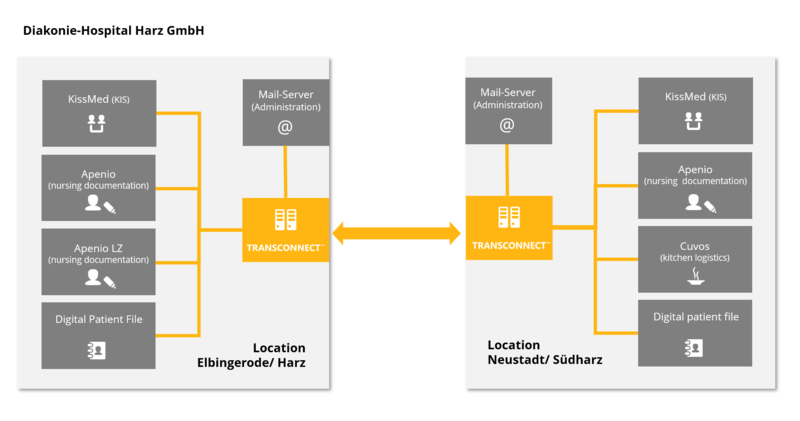 It is not unusual to see a number of direct point-to-point connections between systems. Such an architecture requires a great deal of implementation, maintenance and development work, since each application manages the information in a different format and in different structures, and information exchange is bound by business rules. 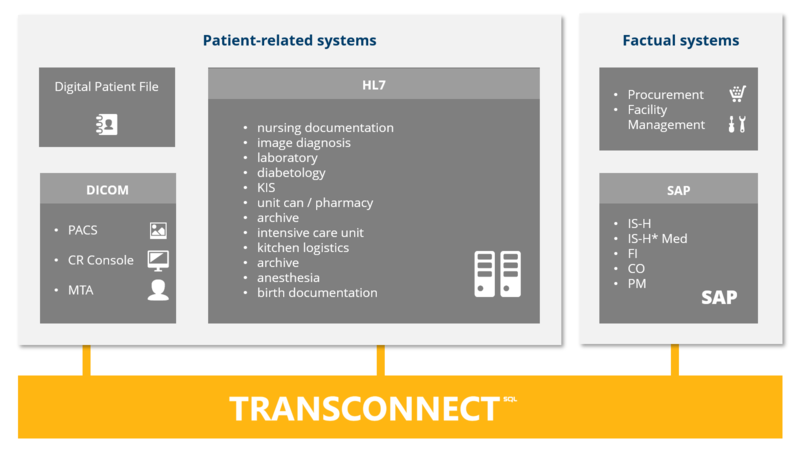 With TRANSCONNECT® HL7, one central integration platform replaces costly point-to-point connections. It is no longer necessary to program and maintain interfaces in the end systems, because the end systems can be flexibly accessed via configurable adapters or services. Data transformations and business rules are stored centrally on the integration server; they are no longer scattered across all systems in the company. Applications share the same data (such as patient data). This eliminates the need to store data in several applications, which often results in inconsistent and redundant data sets.